" Good bye to all "
My coll reopens today (05-09-07), so I've put an end to all my entertaining activities blogging, chatting, playing....and concentrate on studies. If I find time surely I will post new articles. I've learned many things from this blog. So I thank you all for supporting my blog. See you all soon in next holiday. Till then keep a track on my blog - " Good Bye ". This useful article was taken from How to greek.com. I recommend you to visit their website for many useful informations, tips, tricks and many more. To show Windows Vista "super hidden" files, that is, those files that are normally hidden from the user, you'll need to accesss the registry editor. * In the Value Data box, change the value to "1"
orkut Blog: orkut in Hindi, Bengali, Marathi, Tamil and Telugu! In our quest to make orkut universally accessible, we're now available in 5 new languages: Hindi, Bengali, Marathi, Tamil, and Telugu. Indians have always been a vibrant part of the orkut community, and we continue to see more Indians joining orkut every day. It's our goal to make orkut the ultimate tool for self-expression and communication, and we know that if we're not translated into your native language, this becomes harder. So we worked closely with Googlers in our Indian offices to help develop the initial release of these languages. Since there are many different nuances to these languages, we want to hear your feedback. To help us improve the translation or tell us what language you'd like to see orkut in, you can visit our community on orkut: Indian Language Translations. We chose these languages initially because together they cover 80% of India. We do recognize India has more than 400 different spoken languages, but think these 5 are a good start, and we hope that introducing orkut in these regional tongues brings us closer to many more of you to bridge the gap between language and technology. Viewing the orkut site in Hindi, Bengali, Marathi, Tamil or Telugu (or any one of our other 12 languages) is easy. 1. Click the settings button under your profile photo (or click the blue settings link at the top of any page). 2. On the general tab, choose your preferred display language from the drop-down menu at the top of the page. If you are having trouble reading languages on the "Settings" page, it is likely that your browser scripts have not been updated. For Internet Explorer, proceed to "Tools" and then "Windows Update". Here you should accept the Windows XP Service Pack 2 update. All languages are included in this update. We hope this will help many more people enjoy orkut in their own language every day. source: orkut Blog: orkut in Hindi, Bengali, Marathi, Tamil and Telugu! 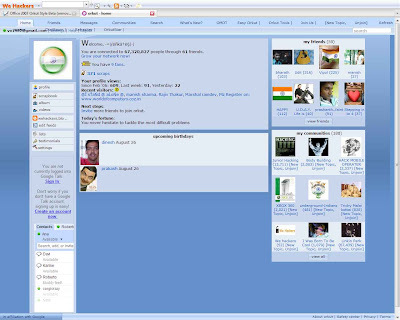 As we all known Orkut changed completely with its now features and Style. * Install greasemonkey extension for firefox if you have not already done so. TransferBigFiles is the easiest way to share a bunch of files with friends, family or everybody in the world. There's no registration required to use the website. You can just go to the home page and start uploading some files. But to make the process even easier, we've created a Windows System Tray tool that allows users to drag-and-drop files to the site. We have not been able to find an easier tool for file sharing. You can send files up to 2GB in single attachment. TransferBigFiles does not limit the amount of space your account can use on our servers, the only storage limit we have is that your files may not be larger then two (2) gigabytes. For a minimum of 5 days or up to 30-days if you upload through a registered DropZone account. DropZone users can also manage there files and expire them prior to 30-days. For regular usage of this service you can use their client, if you want it. TBF DropZone Client : It's the super-easy, super-fast, super-smart way to Transfer Big Files. It's FREE! * Fast, secure & reliable! Share and send links directly from your browser. Submit the web page you are currently viewing to digg, del.icio.us, facebook, google bookmarks, magnolia, reddit, stumbleupon, twitter. If you prefer, e-mail the web page directly to a friend instead. *Bonus feature* - Real-time statistics from digg and del.icio.us. Check whether the web page you're on has been dugg, and how many times it has been saved on del.icio.us. Stats displayed in your browser, at your request. Google search engine can be used to hack into remote servers or gather confidential or sensitive information which are not visible through common searches. Google is the world’s most popular and powerful search engine. It has the ability to accept pre-defined commands as inputs which then produces unbelievable results. Discussed below are various Google’s special commands and I shall be explaining each command in brief and will show how it can be used for getting confidential data. The “intitle:” syntax helps Google restrict the search results to pages containing that word in the title. will return links to those pages that has the word "login" in their title, and the word "password" anywhere in the page. Similarly, if one has to query for more than one word in the page title then in that case “allintitle:” can be used instead of “intitle” to get the list of pages containing all those words in its title. The “inurl:” syntax restricts the search results to those URLs containing the search keyword. For example: “inurl: passwd” (without quotes) will return only links to those pages that have "passwd" in the URL. Similarly, if one has to query for more than one word in an URL then in that case “allinurl:” can be used instead of “inurl” to get the list of URLs containing all those search keywords in it. will look for the URLs containing “etc” and “passwd”. The slash (“/”) between the words will be ignored by Google. The “site:” syntax restricts Google to query for certain keywords in a particular site or domain. will look for the keyword “exploits” in those pages present in all the links of the domain “hackingspirits.com”. There should not be any space between “site:” and the “domain name”. This “filetype:” syntax restricts Google search for files on internet with particular extensions (i.e. doc, pdf or ppt etc). will look for files with “.doc” extension in all government domains with “.gov” extension and containing the word “confidential” either in the pages or in the “.doc” file. i.e. the result will contain the links to all confidential word document files on the government sites. “link:” syntax will list down webpages that have links to the specified webpage. will list webpages that have links pointing to the SecurityFocus homepage. Note there can be no space between the "link:" and the web page url. will list web pages that are similar to the Securityfocus homepage. Note there can be no space between the "related:" and the web page url. will show Google's cache of the Google homepage. Note there can be no space between the "cache:" and the web page url. If you include other words in the query, Google will highlight those words within the cached document. will show the cached content with the word "guest" highlighted. The “intext:” syntax searches for words in a particular website. It ignores links or URLs and page titles. will return only links to those web pages that has the search keyword "exploits" in its webpage. “phonebook” searches for U.S. street address and phone number information. will list down all names of person having “Lisa” in their names and located in “California (CA)”. This can be used as a great tool for hackers incase someone want to do dig personal information for social engineering. Well, the Google’s query syntaxes discussed above can really help people to precise their search and get what they are exactly looking for. Now Google being so intelligent search engine, hackers don’t mind exploiting its ability to dig much confidential and secret information from the net which they are not supposed to know. Now I shall discuss those techniques in details how hackers dig information from the net using Google and how that information can be used to break into remote servers. A webserver with Index browsing enabled means anyone can browse the webserver directories like ordinary local directories. The use of “index of” syntax to get a list links to webserver which has got directory browsing enabled will be discussd below. This becomes an easy source for information gathering for a hacker. Imagine if the get hold of password files or others sensitive files which are not normally visible to the internet. Below given are few examples using which one can get access to many sensitive information much easily. a. Using “allinurl:winnt/system32/” (without quotes) will list down all the links to the server which gives access to restricted directories like “system32” through web. If you are lucky enough then you might get access to the cmd.exe in the “system32” directory. Once you have the access to “cmd.exe” and is able to execute it. c. Using “inurl:.bash_history” (without quotes) will list down all the links to the server which gives access to “.bash_history” file through web. This is a command history file. This file includes the list of command executed by the administrator, and sometimes includes sensitive information such as password typed in by the administrator. If this file is compromised and if contains the encrypted unix (or *nix) password then it can be easily cracked using “John The Ripper”. d. Using “inurl:config.txt” (without quotes) will list down all the links to the servers which gives access to “config.txt” file through web. This file contains sensitive information, including the hash value of the administrative password and database authentication credentials. a. Using [allintitle: "index of /root”] (without brackets) will list down the links to the web server which gives access to restricted directories like “root” through web. This directory sometimes contains sensitive information which can be easily retrieved through simple web requests. b. Using [allintitle: "index of /admin”] (without brackets) will list down the links to the websites which has got index browsing enabled for restricted directories like “admin” through web. Most of the web application sometimes uses names like “admin” to store admin credentials in it. This directory sometimes contains sensitive information which can be easily retrieved through simple web requests. 3) find a file named "hosts"
4) Right click on it and open with word pad. IP*: to find IP address of that website Goto start ->Run > type cmd > enter. Now you have a new window on desktop. On that type this without cotes "ping www. yahoo.com"
try this on your frieds pc and public pc and make them blink. The table below shows the top 25 online backup companies in the world. Our ranking is based on a number of factors. When you think Google, you picture primary colors; when you think orkut, you see blue. And though Orkut updating the look, Orkut staying true to blue. Orkut added some rounded corners and new icons that make orkut look a little more sleek and modern. This makes users to use default without searching for skins Check out a screen shot of the new homepage. Orkut rolling it out to groups of users at a time over the next week. * If there is an executable between the files you extracted, run it. This will install the theme for you. You're done. * If you can't find an executable, you need to install the theme manually. The theme is located in a folder you just extracted. Look for a folder with the same name as the theme. Once you have found this folder, you need to move it to the directory where Google Talk stores all its themes. This is C:\Documents and Settings\USERNAME\Local Settings\Application Data\Google\Google Talk\themes\user\chat. USERNAME needs to be replaced with your windows username. Move the entire theme folder to this location. * Start Google Talk if it's not already running. * Now open your settings window by clicking 'Settings'. * Your theme should appear in the list, if not, you did something wrong. Select the theme and click OK.
* Open a conversation window and watch the magic. :-| :-O :-x :-P :-D ;-) :-( :| :O :x :P :D :) :( ;-| ;-O ;-x ;-P ;-D ;-) ;-( ;| ;O ;x ;P ;D ;) ;( B-| B-O B-x B-P B-D B-) B-( B'( BO Bx BD B) B( B) And you can put a ' between the characters to get another one shown in blue. * What you need to do to have conference calls: Open up a copy of Google Talk on all computers with which you wish to conference. After one copy is opened make a new shortcut for Google Talk but at the end of it add /nomutex. If you installed it to the default folder then your shortcut should read "C:\Program Files\Google\Google Talk\googletalk.exe" /nomutex. Open 2 instances of the software on every user's computer. After this start a chain: User 1 should connect on one instance to user 2. User 2 will connect on his second instance to user 3. User 3 will connect using his second instance back to user 1. With this chain everyone is connected to everyone. or To change the nickname need to go to your Gmail account and change the name there. Choose Settings, Accounts, and then Edit info. Click on the second radio button, and enter your custom name. * You can add a website in your custom message, it will be clickable when someone opens a conversation window with you. * You don’t need to say Yes or No when someone wants to add you as a friend; you can simply ignore it, the request will go away. (On the other hand, someone with whom you chat often will automatically turn to be your friend, unless you disable this). Mixer Device. Now the Recording Control screen should be up. On my computer I selected "Wave Out Mix". Click on the green phone in Google Talk and call your friend. * /autostart: when Google Talk is run with this parameter, it will check the registry settings to see if it needs to be started or not. If the "Start automatically with Windows" option is unchecked, it won't start. * /forcestart: same as /autostart, but forces it to start no matter what option was set. * /register: registers Google Talk in the registry, includig the GMail Compose method. * /plaintextauth: uses plain authentication mechanism instead then Google's GAIA mechanism. Used for testing the plain method on Google's servers. * /nogaiaauth: disables GAIA authentication method. The same as above. * /factoryreset: set settings back to default. * /gaiaserver servername.com: uses a different GAIA server to connect to Google Talk. Used for debug purposes only, there are no other known GAIA servers. * If there’s something you think is missing in Google Talk, send off a message to Google. * There was a hidden game in Google Talk. In the about screen you could see 'play 23 21 13 16 21 19 . 7 1 13 5'. Each number represented a letter. a=1, b=2, c=3 .... When you translated this message it said: 'play wumpus.game'. To play this game you had to invite wumpus.game@gmail.com as a friend. wumpus.game@gmail.com is always offline now. You can still play Hunt the Wumpus here. 1. Open run in the start menu and type regedit. Press enter. 3. Right click on ‘Post Platform’ and add new string value. Enter “Alexa Toolbar”. Save the registry and restart your computer. b) Use Megaupload if your country slot is limited. 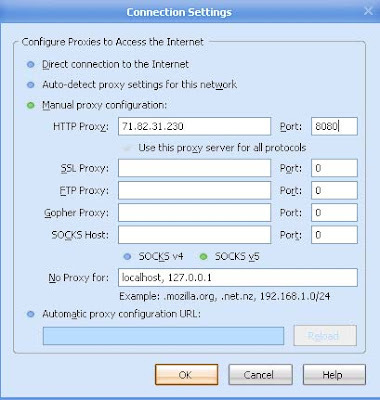 Enter setting like this screenshot: make sure that you change the proxy address. I knew a lot of us here use Rapidshare to download and share a lot of stuff. It's quite annoying when we were unable to download for a certain period after downloading a big file. What are going to be shared to day is how to download from Rapidshare using proxy so that you won't have to face the 1 hour limitation problem again. 1) I don't want to delete my Firefox or IE cache and cookies files. 1. Download the browser from this location. Install it. 2. Get a proxy list here. This trick requires the usage of proxy server to work. So don't skip this step. Grab one proxy or more! * If you want to add more proxies, repeat the steps above again and again. browsers’ address bar, and wait for the Rapidshare page to launch. 6) After downloading a file, don’t forget to clear your trace! Click both Delete Cookies and Delete Files button to wipe out all references to Rapidshare. If you need to download more files, repeat all steps from 1 to 6, and hopefully you’ll be happier than ever. 2. Avoid choosing proxies addresses <195 because some of them are slow. Windows 7 is a Microsoft future operating system expected to be released windows-seven-wallpaper in early 2010 or later. Formerly codenamed Black comb, and then Vienna, it’s no longer a secret that Microsoft has started working on this operating system since the release of Windows Vista. Long Z; the designer of the famous Vista Aurora wallpaper recently has created Windows 7 wallpaper pack for anyone who is interested to Vienna. The unofficial logo concept was his idea and the wallpaper pack was shared by Frank on deviant art. Simple, pretty, and Microsoftish. That’s how I would describe this set. The wallpaper is available in different screen resolutions and you can download them here. Orkut: Subscribe to RSS feed of any Scrapbook & Community with just one-click! This GreaseMonkey Script for Orkut adds a link to RSS feed of current users scrapbook or community posts in top header menu of Orkut! If you are good at math then you can realize all you need is one-click to reach any Orkut users scrapbook or community! Also for advance firefox users, the RSS Link will be integrated into orkut so that you can get RSS indicator in navigation/address bar as shown in following screenshot. The RSS indicator is context sensitive and will automatically point to scrapbook or community RSS depending on which page you are! Clicking on it will again take you to Firefox Feed Subscription page as shown above! > If you are in Firefox and already installed Grease monkey Add-on, then Click here to install the script! As you certainly know, the right mouse button brings up what is known as the “context menu.” As the name implies, the choices available on the menu differ according to the current situation. Well, here are 5 tips involving context menus that you may not know. On thing you may not have noticed is that one item in every context menu is usually presented in bold. This is the default action that is taken when the left mouse button is used. Tip #1: If you are ever in doubt about what will happen when you double-click on something (with the left mouse button), then use the right mouse button to bring up the context menu, and look for the item in bold. Right-click also works with click and drag operations. Try this the next time you do a click and drag: Instead of clicking with the left mouse button, and then dragging the object, use the right mouse button. When you finished dragging (i.e. when you do the drop), a context menu will appear (a different one, specifically for dragging). This shows you all of the actions that are available for the combination of the object that you are dragging and the location you have dragged it to. Once again, the default action will be shown in bold. This is the action that normally occurs when you use the left mouse button to do the click-and-drag. Tip #2: If you are ever in doubt about what will happen when you click-and-drag an object (with the left mouse button), then use the right mouse button to perform the dragging, and then look for the action that is in bold. When might you be in doubt? Well, in the case of dragging files around within the Windows Explorer, two of the possible actions are Move and Copy. These two take turns being the default action, depending on the drop zone. If you are dragging a file to a different location on the same to disk drive, then Move is the default action, but if you drag it to a different to disk drive altogether, then Copy is the default action. Another option available when using drag-and-drop in Windows Explorer is to create a shortcut to the object, rather than copying or moving the object itself. Tip #3: Use right-click-and-drag to quickly create a shortcut to an object on your desktop. This will leave the actual object in its original (proper) location, yet give you convenient access to it from the desktop. Tip #4: A corollary to Tip #3 — Using right-click-and-drag to create shortcuts is particularly handy when dealing with batch files. When you create a shortcut to a batch file it gives you more control over executing the batch file then simply double-clicking on the batch file itself. This is because the shortcut contains adjustable properties specifically for this purpose. So, after creating a shortcut, right-click on the shortcut, select the Properties option, and then adjust them as necessary. 7-Zip file archiver with high compression ratio. 7-Zip is a rock-solid file archiver for Windows with a high compression ratio. It is the premier archiver for the LZMA compression format (a.k.a. 7z). 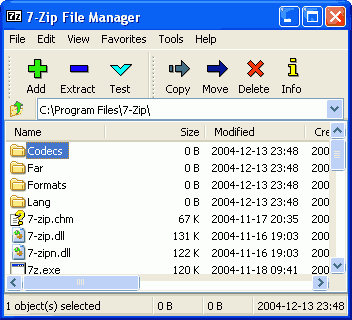 Indeed, the 7-zip web site is also the home of the LZMA SDK (Software Development Kit). * New fast compression mode for Deflate method in Zip and GZip. * New “Compress shared files” option in GUI and -ssw switch. * Some bugs were fixed. * New localization: Norwegian Nynorsk. A modern PC with Vista Home Edition takes about one and a half minutes to boot. An older machine with XP is about the same. That’s 30 seconds for the PC itself (the BIOS) to boot up, plus a minute for the Windows operating system to boot. Sometimes, you need to reboot Windows (e.g. when installing new software), but there is no need to restart BIOS, too. However, the default is to reboot both. (That’s called doing a “cold boot,” rather than a “warm boot.”) There’s a trick that works on both XP and Vista to get it to do a warm boot instead, thus saving you 30 seconds per cycle. The trick is to hold down the SHIFT key when invoking the restart. Windows Vista: Select Start, then hover over the right arrow that is to the right of the padlock icon until the pop-up menu appears that contains “restart” as one of it’s choices. Hold down the SHIFT key while clicking on the “restart” choice. Get paid for inviting friends and get more promo. Create and sell mobile contents to friends like wallpaper, screen saver,etc.. So, Rs 6 + Rs 60+ Rs 600 adds up to a cool Rs 666! Now Orkut allows Images and html code on Scrap, many friends asking me to give nice website for collection of animation, images, etc.. Image Generators: imageGenerator.net provides you with an easy way to add text to various images, allowing you to create a funny picture, or to illustrate a joke. You can save these pictures online and send them to your friends, or show them on your favorite message board or website. Animation Factory: 500,000 Animations, Animated Clip art, Motion Designs for Video, PowerPoint, Flash, Websites, E-mail and more!. Use our unique animations, Flash designs, video elements, PowerPoint templates, sounds, music, and backgrounds to bring your projects to life! Become a member of Animation Factory and immediately start downloading from our huge library. Hundreds of new items added every week. Best Animations: Best Animations is a collection of free animated gifs found on the web. Except where indicated with an asterisk all animated gifs are believed to be free to use. If an asterisk appears next to an animation then you must check the copyright restrictions posted on the site linked at the bottom of the page where the animation appears. Please notify the webmaster if you see a copyrighted animation that is not credited. Animation Library: the NEW Animation Library, a site featuring over 13,748 free animations for you to use on your website or send as digital postcards using our powerful Postcard Station. While you are browsing the Animation Library, you can listen to great music by using the Jukebox. To navigate our site, just use the Links in the menu below and on the sidebar to select animation you want to see. Enjoy your visit! Gif animations: This is the Internet's original and largest collection of free animated GIFs. Right here, you have access to more than 20,000 animations, clipart and backgrounds. Price tags are not included and no registration is ever necessary. You can put this site on your browser's Favorites menu right now. Just press CTRL + D (works for most browsers). Then come back often to check out the new images that have been added. Free animations: All the animations are free to download and use on your websites, emails and desktops. Many of the free animations and graphics have been created by the Webmaster, so you know you are getting original images. The 3D Words and messages are especially interesting. These have been created by the Webmaster using several types of software as listed in the disclaimer. 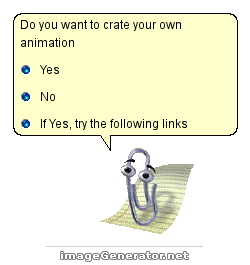 Animation Gold: large collection of free animation and clipart that you can download for free. Our archive of animation and clipart includes lots of new animated gifs and clipart you've probably never seen before. We will continue to make new animation and add it to our site. Click the free animation link at the left and it will take you to our animation page where you will find the animation menu listed by category. Animation Central: Welcome to animation central where we serve up hundreds of free animations on the best free animated gif archive on the net today. fg-a.com: Everything Needed To Build Or Enhance Your Web Site. Zwani: No Popups... No Spyware... No Spam! Just 1000's of Comments & Graphics To Use Everyday! Zwani.com is THE place to get all of the comments and graphics you could ever need for use on Myspace, friendster, Hi5, Myeeos, your website, friends blog or any other place you want to add a little comment or graphic. From comments and quotes to backgrounds, page codes and glitter graphics we have it all! Your computer is tracking all your actions and stores the evidence into your hard disk. Anyone else can see where you have been on Internet and the images, movies you have seen, even everything you did on your computer would leave traces on your computer, Perhaps you stumbled onto one or two adult Web sites. Perhaps by accident. Perhaps on purpose. And you don't want your husband/wife, dad/mom, boss/colleague or anyone else to know you've been there. You can clear your history or empty your cache file in your browser's settings, but it will not protect you, some files can not be Erase. Eraser will automatically remove all traces of your internet history! Keystroke logging (often called keylogging) is a diagnostic tool used in software development that captures the user's keystrokes. It can be useful to determine sources of error in computer systems and is sometimes used to measure employee productivity on certain clerical tasks. Such systems are also highly useful for law enforcement and espionage—for instance, providing a means to obtain passwords or encryption keys and thus bypassing other security measures. However, keyloggers are widely available on the Internet and can be used by private parties to spy on the computer usage of others. Writing software applications for keylogging is trivial, and like any computer program can be distributed as a trojan horse or as part of a virus. What is not trivial however, is installing a keystroke logger without getting caught and downloading data that has been logged without being traced. An attacker that manually connects to a host machine to download logged keystrokes risks being traced. A trojan that sends keylogged data to a fixed e-mail address or IP address risks exposing the attacker. Blazing Tools Perfect Keylogger 1.67 - Perfect Keylogger is a new generation keylogger which is absolutely undetectable. It was created as an alternative to very expensive commercial products like iSpyNow, Spector Keylogger or E-Blaster. It has the same functionality, but is significantly easier to use. Complex internal mechanisms are hidden from the user behind the friendly interface. You can install Keylogger and immediately use it without changing of its settings. Perfect Keylogger is an extremely compact, award-winning tool. It is translated into 20 languages and is increasingly popular around the world! It lets you record all keystrokes, the time they were made and the application where they were entered. It works in the absolutely stealth mode. Stealth mode means that no button or icon is present in the Task Bar, and no process title is visible in the Task Manager list. Also, Perfect Keylogger can carry out visual surveillance. It periodically makes screenshots in invisible mode and stores the compressed images on the disk so you can review them later. Advanced Invisible Keylogger 1.8 - Advanced Invisible Keylogger is an stealth spy tool, the best spy software offered by ToolAnywhere! Advanced Invisible Keylogger runs silently at the lowest level of Windows capturing every keystroke including usernames and windows log-on passwords. Advanced Invisible Keylogger can also capture active window text, text typed in all popular instant messengers including AOL, YAHOO, ICQ, MSN and AIM. All Desktop activity will be recorded through Advanced Invisible Keylogger’s secret! Have reports sent to your email address at anytime secretly! Advanced Invisible Keylogger is so stealthy and hides so well that not even a computer technician with years of experience can detect it running! With the Google Reader Watcher extension you can check your feeds regularly, you can see which feeds have unread news. You can open the Google Reader directly from the status bar and not at last, you can configure the extension to login with your Google Account automatically. > click on Stylish icon and select "Find Styles for this page"
In Windows, Telnet can be found by going to Start -> Run and then typing telnet. The application should then pop up. If you don't have Windows, there are many Telnet alternatives for mac, linux etc. Since I don't know any,search the internet for Telnet for Linux or Telnet for Mac and you should find something instantly. As you can see, Telnet has 4 menu options. These are Connect, Edit, Terminal, and Help. If you click Connect, you should see more options. Here they are. Names of servers you have been on. There should also be a Connect button and a Cancel Button. Lets go over these & what you should put in them. or you can keep it Telnet and see what happens. TermType is the type of Terminal telnet will be acting like. This doesn't matter most of the time, so you can keep it to default or try other ones if you want. When you have all this set up, you can Click Connect & see what happens. Note: Sometimes many servers don't like anon people just logging on, so be careful when logging onto servers, because sometimes it might be some big company that likes bullying people or just SOMEONE who likes bullying people and then they might want to find you or trace you or something and I know for a fact you don't need that happening. Another Note: When you go to a server and type something, such as a login name or a password, you might not see anything even though you are typing. this is a feature that telnet or the other server uses. It's for some kind of safety measure. Ok that's all for the Connect Menu, lets go over the Terminal menu. you everything you've typed, Blinking cursor if you want the cursor to blink check it, if not un check, Block cursor if you want the cursor to be shown as a block, VT100 Arrows, don't worry about these they are useless, Buffer Size, this allows you to set the number of lines of text you want to be shown before the screen starts to scroll, The Terminal emulation type, always have this set on the default unless you know what the second one is and you know what your doing. This logs everything you do on Telnet in a log file on your computer. This will stop logging processes. Well that's it for basics of telnet. Thanks for reading. To see the ip all computers you are connected to (web servers, people attempting to hack into your computer). Go to dos (start>run>type command) and run the netstat command. Type netstat /? for details. In MSN (and other programs) when you are chatting to someone everything you type goes through the MSN servers first (they act as a proxy) so you see their ip rather than who you are chatting to. You can get round this by sending them a file as MSN doesn't send file through its proxy. When you type the netstat -r (or -a for a different view) the ip's are under the foreign address table. The ports are seperated by a : . Different programs use different ports, so you can work out which ip's are from which program. Servers send information. Clients retrieve. Simple. Windows comes with a built in program to connect to other computers called telnet. There are thousands of different programs using different ports. You can get programs called portscanners which check a computer for all ports up to a certain number, looking for ways in. You can portscan a computer looking for ways-in. Type www.yahoo.com as the host and port as 80 the click connect. If nothing happens, you're in. Wow. You are connected to Yahoo's server. You can now type http commands (you are connected to an http server, so it supports http commands). Ie. on an ftp server you can type open and it will do something. On an http server it will just wonder what the hell you are on about. Save it as something.reg then run it. Simple. Proxies are computers that you connect through, hiding your computer. Most aren't anonymous, they give away your ip. Some are. Good anonymous proxies: mail.uraltelecom.ru:8080 and 194.247.87.4:8080. 1. 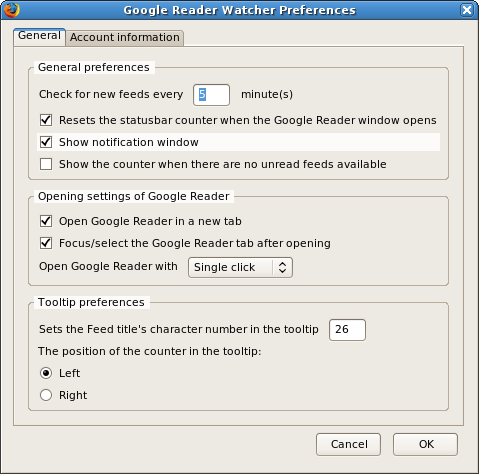 Open Firefox, go to the View menu, select Toolbars and untick the 'Bookmarks Toolbar' item. 2. If you have a Sidebar showing, under the View menu select Sidebar and unselect any items. 3. Under the View menu select Toolbars and then select Customize. Alternatively you can right-click on an empty spot on a toolbar and select Customize. 4. In the 'Customize Toolbar' box which appears, select Icons in the Show box (not 'Icons and Text', or Text). If you're running a lower screen resolution also tick the 'Use Small Icons' box. 5. Now remove every icon or element in the Firefox toolbar at the top of the browser which you don’t need. For example, drag and drop the Search box into the 'Customize Toolbar' box to remove it from the Firefox toolbar. Do the same for any other icons/elements which you feel are unnecessary, such as the large white space filler at the top right of the Navigation toolbar. You can always re-add these elements at any time if you change your mind later on. 6. Now drag and drop each icon in the bottom Firefox toolbar up to the top toolbar, just to the right of the 'Help' menu item. This includes the large white Address box. The aim is to have everything on a single toolbar. 7. Insert any additional icons, separators or blank spaces you need from the selection shown in the 'Customize Toolbar' box into the relevant spots on the top Firefox toolbar. When finished, click the Done button. 8. Finally, go to the View menu, and under Toolbars unselect the 'Navigation Toolbar' as it should now be completely empty anyway. You should now have a single Firefox toolbar at the top of your browser, complete with all the menu commands, relevant icons and the address box. This gives you more vertical viewable space (and a substantial amount of horizontal space if you had a sidebar showing). If you need more, go to the View menu and untick the 'Status Bar' item as it is not vital, and provides a further bit of vertical viewable space. Obviously this layout may not suit everyone, and can be modified to suit your taste. However once you get used to it, it is extremely efficient and provides maximum viewable space in Firefox. Note that you can further customize the layout by looking under the Advanced Tweaking section. These are settings that enable Pipelining which makes firefox do multiple data requests at once, which speed things up a bit. This next group of hacks deal with the download manager in Firefox. For those of you that don’t use the Firefox download manager, skip this section. Follow these steps to tweak/destroy your manager. 1. With Firefox up and running, type about:config and hit enter. 2. Take your pick of the following attributes to modify. 3a. browser.download.manager.showAlertInterval at default shows the alert message for 2000 milliseconds or 2 seconds. I personally set it to 500 milliseconds; all I need is a quick blurb telling me my download is done. 3b. browser.download.manager.openDelay at default opens up the download manager immediately, which can be a big pain if you are downloading 10Kb files to your desktop, you don’t need that annoying manager to pop up. I have this guy set on 30,000 milliseconds or 30 seconds. If a file is larger than 30 seconds of download time, I might want to watch its progress. 3c. browser.download.manager.closeWhenDone at default is set to false so that your manager doesn’t close itself. I set it to true just to get this thing out of the way the moment it is done, I like to watch progress, but I don’t need to waste space or the time to close it. 3d. browser.download.manager.flashCount at default flashes the download manager icon in your taskbar for 2 seconds, I prefer zero seconds to reduce annoyance, adjust to your preference. This next hack deals with the memory Firefox uses as cache. In the default setting, Firefox will adjust the cache size to fit however many pages you have open. While this is useful, if you tend to only have a few pages open at a time, you can manually reduce the setting to a specified amount at the cost of reducing performance when Firefox runs out of cache. To implement this hack, follow these steps. 2. Right click on the new page and select New -> Integer. 3. In the pop-up window, type in “browser.cache.memory.capacity”. In the following pop-up window, specify how many Kb of ram you want to dedicate to the cache, I selected 32768(32Mb). I suggest a number between 16Mb and 64Mb, anything lower and performance will suffer, anything higher is excessive. Here you should experiment, or don’t bother if it worries you. The first hack that I have here is the popular Firefox Minimize Hack that has recently flashed through the internet. The purpose of this hack tries to keep Firefox from eating up your physical RAM and instead puts the burden on your hard drive, or at least that is the general reason behind it. To implement this hack, perform the following steps. 2. Right click on the new page and select New -> Boolean. 3. In the pop-up window, type in “config.trim_on_minimize” without quotes and hit enter. 4. In the next pop-up window, select True and hit enter. With that done, open up a bunch of tabs and monitor the memory usage. In my first run without this hack, Firefox was using 137.8 Mb of Ram. With all 30 tabs open again, Firefox was using 118.4 Mb, but when minimized this dropped to an astounding 4 Mb. However, this was too good to be true, I left Firefox minimized and came back 12 minutes later and the memory use had slowly creeped up to 42.4 Mb. While this was 10 times larger than the initial 4.2 Mb, I was still saving about 75 Mb. One note about this, the memory was still very slowly creeping up by about 1 Mb per minute, maybe more or less per minute, but either way it was still creeping. I would have liked to test to see if it would creep up to the original 118.4 Mb but that would have required more than an hour and I am impatient. Another note, when I had Firefox maximized it was using 66 Mb with Flickr.com as the main tab, but 119 Mb when I quickly browsed through all my tabs and then quickly retreated back down to 66 Mb. I don’t know what causes this, but either way, for the most time it was using 66 Mb. The Portable Apps Suite™ is free. It contains no spyware. There are no advertisements. It isn't a limited or trial version. There is no additional hardware or software to buy. You don't even have to give out your email address. It's 100% free to use, free to copy and free to share.